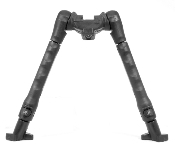 Versatile bipod, mounts onto a Picatinny rail in seconds. Legs can be attached/detached with two swift movements. The 3” Picattiny Rail allows the addition of a foregrip without taking up more space on the handguard. New recessed design allows legs to be mounted higher, giving a lower and more stable center of gravity. Comfortable rubber covers legs allowing a non-slip grip. Legs can be attached/detached with two swift movements. Due to the included #RB adaptor, allows Picatinny rail for the addition of forearm grip & other devices. New recessed design, allows legs to be mounted higher, giving a more stable center of gravity. Comfortable rubber covers legs, allowing a non-slip grip. Operating the pods separately. Each pod is not depending on the other at all. Quick release push button leg extension. Legs manufactured from stainless steel. No external springs - the whole mechanism is well covered. Redesigned feet provide increased stability. Legs can be folded to the front or back.